Aspen Community Foundation executive director Tamara Tormohlen speaks at the foundation's grantee luncheon at the Hotel Jerome Friday. One of the greater challenges in fundraising for an Aspen nonprofit is battling the city’s image as a widely affluent, glamorous resort. “We’re fighting this misconception about Aspen that it’s all champagne and caviar and glitz and glam,” said Oliver Sharpe, Aspen Youth Center board president, on Friday at the Aspen Community Foundation’s grantee luncheon. “The community here, and the people who actually make this town run, they have to work jobs and their kids have to go somewhere after school,” Sharpe said, referring to the Youth Center’s after-school program, which is free thanks to donations and grants from nonprofits like the Aspen Community Foundation. The Community Foundation hosted a luncheon at the Hotel Jerome ballroom to recognize the efforts of its 2017 scholarship recipients. Aspen Community Foundation handed out a total of $1.1 million in grants to 35 nonprofits from Aspen to Parachute. For such organizations as A Way Out, which aids people struggling with addiction, those dollars help provide free treatment to children, teenagers, adults and families. Despite launching four years ago, the nonprofit reaches Pitkin, Eagle and Garfield counties, with offices in Aspen, Carbondale and Eagle County, executive director Elizabeth Means said. A Way Out frequently works with families because when one member suffers from addiction, “it becomes a family disease,” she said. Altogether, more than 400 donors — including individuals, businesses, organizations, board members and Aspen Skiing Co., which started the Community Foundation in 1980 — contributed to the 2017 grants. Speaking before the room of about 100, Community Foundation executive director Tamara Tormohlen touched on Sharpe’s sentiment. Recognizing that grants alone “will not solve this crisis,” Tormohlen advocated for a “multi-faceted,” communal approach. 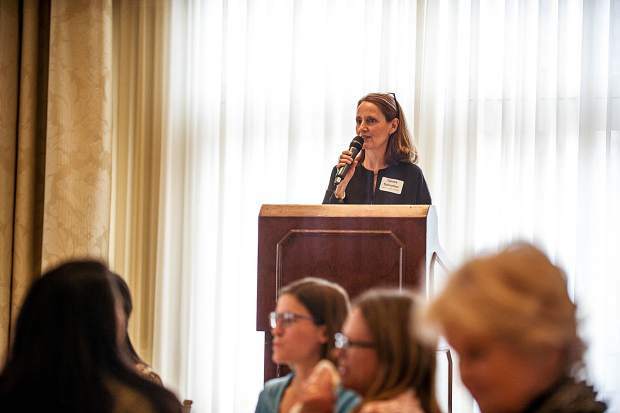 Friday’s event marked the Aspen Community Foundation’s first luncheon to acknowledge its grant recipients; in years past, nonprofits just received a check in the mail. The thought behind the luncheon was simply to bring the groups together, she said.